Pulses-The Superfood That Always Have Bean! The UN declared that 2016 was the year of the PULSE! In case you have never heard the term pulse, it is another terms for category of legumes. 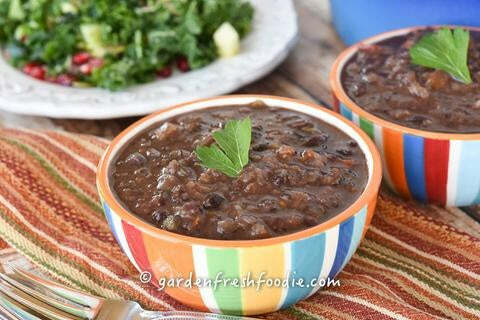 In the legume family are a variety of beans; black, kidney, pinto, black-eyed peas, split peas, mung, cannellini, chick peas, soy, and all of the lentils; black, green, yellow, brown, and other unique varieties. Legumes are rich sources of plant-based protein and should be added to your daily routine. Unlike animal-based proteins, plant-based proteins have more than just protein. They are rich sources of magnesium, potassium, folic acid, and fiber. These nutrients are outstanding for heart health and reducing the risk of diabetes. Their high fiber content makes them great for improving digestive health and reducing the risk of many forms of cancer. They are also low-glycemic, helping to prevent blood sugar spikes in the body, and decreasing excess insulin production. With all these health benefits, they're also awesome for the planet. They help to fix nitrogen, making it more readily available for other crops, reducing the need of outside fertilizers.But, as Americans, we eat VERY little from this important group. 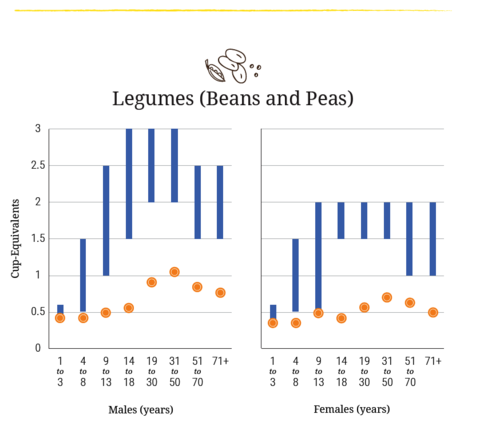 It is estimated that most Americans don't even consume 1/2 cup of legumes, when the amount recommended is between 1.5-3 cups per day, as per the USDA 2015 dietary standards (below). Legumes are eaten around the world as an inexpensive form of protein. They can be purchased organically in bulk, making them a really inexpensive addition to meals. 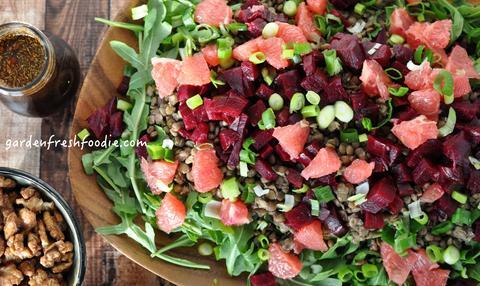 Lentils are the fastest cooking of the legumes. They don't need to be soaked, however you can soak them to help with digestion. 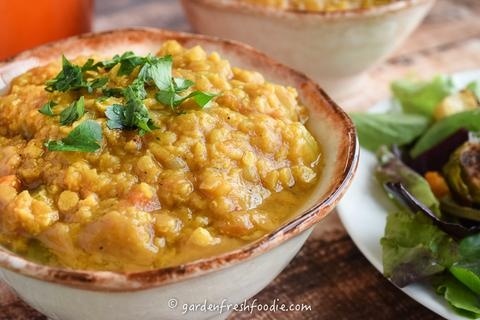 Red lentils cook the fastest and create a cream-like texture as they cook. For lentils that hold their shape, try black, green, and brown. Of the beans, mung beans are the fastest cooking. All beans are easy to prepare if you plan ahead. It's best to soak beans for 8 hours. This can be done overnight or in the morning before leaving the house for work. If you have a pressure cooker, soaked beans can be cooked in 12 minutes of pressurized time. Typical stovetop cooking times average 1 1/2-2 hours. Be sure not to add salt while you're cooking, this actually toughens the legumes. By cooking your own beans, you save money, create less waste, decrease exposure to BPA-lined cans and added sodium. Plus they taste better!Many people state that legumes upset their stomach. This is most likely due to their high fiber content, which most Americans aren't used to having. I recommend you gradually increasing your intake of legumes, beginning at a quarter cup, eventually getting to 2-3 cups daily. Your body will adjust to the increasing amount of fiber in your diet and will not have such difficulty. Another way to ease digestive issues, is to soak your beans over night, and cook them with some kombu, a form of seaweed. The seaweed lessens the gassy effects many report to having with legumes.For some great recipes with a pulse :) check out these recipes, and more on www.gardenfreshfoodie.comHappy and healthy eating!